Glass. Nigel Bunce and Jim Hunt. The Science Corner. No 38 (1984). Do cathedral glasses flow? Edgar Dutra Zanotto. American Journal of Physics. Vol. 66 No. 392 (1998). Is Glass a Liquid? Veritasium. YouTube (2015). Stained glass is thicker at the bottom, so is it a liquid? Earth's mantle enables plate tectonics, so is it a liquid? Is Glass Liquid or Solid? Philip Gibbs. Usenet Physics FAQ (1996). Viscous flow of medieval cathedral glass. Ozgur Gulbiten, John C. Mauro, Xiaoju Guo, Olus N. Boratav. Journal of the American Ceramic Society. Vol. 101 No. 1 (2018): 5–11. Viscosity of a Standard Borosilicate Glass. A. Napolitano and E.G. Hawkins. National Bureau of Standards (1970). Viscosity of a Standard Lead-Silica Glass. A. Napolitano and E.G. Hawkins. National Bureau of Standards (1966). Viscosity of a Standard Soda-Lime-Silica Glass. Albert Napolitano and Earl G. Hawkins. Journal of Research of the National Bureau of Standards—A. Physics and Chemistry. Vol. 68A No. 5 (1964). Structure of a New Dense Amorphous Ice. Finney, et al. Physical Review Letters.Vol. 89 No. 20 (2002). Structural Amorphous Steels. Z.P. Lu, C.T. Liu, J.R. Thompson, and W.D. Porter. Physical Review Letters. Vol. 92 (2004). Toothpaste Is a Glass. Physical Review Focus. Vol. 6 No. 24 (2000). Word of the Week: Glass. Paul Adams. Cook's Science Newsletter (2017). ZBLAN Research Takes Step Forward. Marshall Spaceflight Center. NASA. Zirconium, barium, lanthanum, aluminum, and sodium. Allotropes. Nigel Bunce and Jim Hunt. The Science Corner. No. 40 (1984). Diamond. Molecule of the Month. University of Bristol. The Mysterious Allotropes of Carbon. Dendritics (gemstone retailer). Nearly all of the links are broken, but the concepts on this page are still sound. C60: Buckminsterfullerene. H.W. Kroto, J.R. Heath, S.C. O'Brien, R.F. Curl, & R.E. Smalley. Nature. Vol. 318 (1985): 162–163. C60: a New Form of Carbon. W. Krätschmer, Lowell D. Lamb, K. Fostiropoulos, & Donald R. Huffman. Nature. Vol. 347 (1990) 354–358. Man-made Diamonds. F.P. Bundy, H.T. Hall, H.M. Strong, & R.H. Wentorf Jr. Nature. Vol. 176 (1955): 51–55. Preparation of Diamond. H.P. Bovenkerk, F.P. Bundy, H.T. Hall, H.M. Strong, & R.H. Wentorf Jr. Nature. Vol. 184 (10 October 1959): 1094–1098. Cool Chocolate. Mark Ward. New Scientist. No. 2133 (1998). On the Preparation of Suppositories. William G. Ewing. American Journal of Pharmacy. Vol. 43 (1871). Polymorphism of cocoa butter. R. L. Wille and E. S. Lutton. Journal of the American Oil Chemists Society. Vol. 43 No. 8 (1966): 491–496. Real-time X-ray powder diffraction investigations on cocoa butter. II. The relationship between melting behavior and composition of β-cocoa butter. Kees van Malssen, René Peschar, Henk Schenk. Journal of the American Oil Chemists Society. Vol. 73 No. 10 (1996): 1217–1223. The Materials Science of Chocolate. Peter Fryer and Kerstin Pinschower. Materials Research Society Bulletin. Vol. 25 No. 12 (2000). What is Stainless Steel. Australian Stainless Steel Development Association (ASSDA). World Trade Center Disaster Study. National Institutes of Standards and Technology (NIST). About Stainless. Southern Africa Stainless Steel Development Association (SASSDA). Types and grades of Stainless Steel Plate. Stainless Plate Products USA. The ε Phase of Solid Oxygen: Evidence of an O4 Molecule Lattice, Federico A. Gorelli, et al. Physical Review Letters. Vol. 83 No. 20 (November 1999): 4093–4096. New Form of Oxygen Found. Philip Ball. Nature News. (2001). Experimental detection of tetraoxygen. Fulvio Cacace, Giulia de Petris, Anna Troiani. Angewandte Chemie International Edition. Vol. 40 (2001): 4062–4065. Allotropy: Why Winter Spells Trouble for the Tin Man. Physics Central. American Physical Society (2015). grey tin (tin pest) time-lapse video. wwwperiodictableru. YouTube (2009). Beta tin to alpha tin transformation, time lapse video of sample maintained at −40 ℃. Total time of transformation - ca 20 hours. Water Boiling at Everest. Periodic Videos. YouTube (2013). Boiling water at various altitudes on the trek from Lukla to Everest Base Camp. 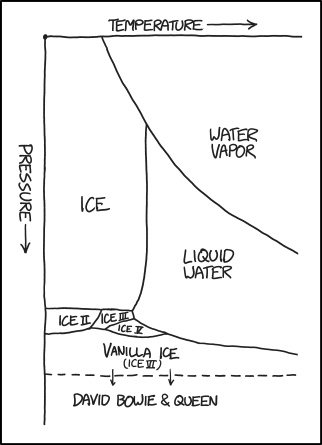 Water Phase Diagram. Randall Munroe. xkcd (2015). Ih. Ordinary ice found on Earth. Ic. Eine kubische Eismodifikation. Hans König. Zeitschrift für Kristallographie. Vol. 105 No. 1 (1943): 279–286. II, III. Über die Schmelzkurve des Eises. Gustav Tammann. Sitzungsberichte der Naturforscher-Gesellschaft bei der Universitdt Jurjeff. Vol. 12 (1899): 295–299. IV, V, VI, VII. The Phase Diagram of Water to 45,000 kg/cm2. Percy Bridgman. Journal of Chemical Physics. Vol. 5 (1937): 964–966. VIII. Dielectric Properties of Ice VII. Ice VIII: A New Phase of Ice. E. Whalley, D.W. Davidson, and J.B.R. Heath. Journal of Chemical Physics. Vol. 45 No. 3976 (1966). X. Effect of high pressure on the Raman spectra of ice VIII and evidence for ice X. K.R. Hirsch and W.B. Holzapfel. Journal of Chemical Physics. Vol. 84 No. 2771 (1986). XI. Calorimetric study of a phase transition in D2O ice Ih doped with KOD: Ice XI. Takasuke Matsuo, Yoshimitsu Tajima, Hiroshi Suga. Journal of Physics and Chemistry of Solids. Vol. 47 No. 2 (1986) 165–173. XII. The structure of a new phase of ice. C. Lobban, J.L. Finney, W.F. Kuhs. Nature. Vol. 391 (1998): 268–270. XIII. XIV. The preparation and structure of hydrogen ordered phases of ice. Christoph G. Salzmann, Paolo G. Radaelli, Andreas Hallbrucker, Erwin Mayer, John L. Finney. Science. Vol. 311 (2006): 1758–1761. XV. Ice XV: A new thermodynamically stable phase of ice. Christoph G. Salzmann, Paolo G. Radaelli, Erwin Mayer, John L. Finney. Physical Review Letters. Vol. 103 (2009): 105701. XVI. Formation and properties of ice XVI obtained by emptying a type sII clathrate hydrate. Andrzej Falenty, Thomas C. Hansen, Werner F. Kuhs. Nature. Vol. 516 No. 7530 (2014): 231–233. XVII. New porous water ice metastable at atmospheric pressure obtained by emptying a hydrogen-filled ice. Leonardo del Rosso, Milva Celli, Lorenzo Ulivi. Nature Communications. Vol. 7 No. 13394 (2016).